If you’re looking for a more grown-up way to enjoy Easter this weekend, take a lead from the world’s best bartenders and try your hand at recreating one of these decadent drinks. Melita Kiely reports. Easter has become synonymous with long weekends, quality time with friends and family and, of course, the traditional feat of gorging on one too many chocolate eggs. But for those who are looking for alternative ways to indulge this weekend – perhaps in a more grown-up, boozy fashion – we’ve compiled a selection of decadent cocktails for your enjoyment. Designed by skilled bartenders from around the world, below you’ll find recipes to suit sweet and savoury palates alike, as well as different cocktail mixing abilities. Shake all ingredients with ice. Double-strain into glass with white chocolate rim. In a mixing glass filled with ice, add the black walnut bitters, then home-made cocoa maple syrup, Pedro Ximénez Sherry and Scotch infused with shiitake mushrooms. Stir the drink to chill the mixture and create dilution. Double-strain into a rocks glass over fresh ice. Garnish with an amarena cherry. Stir and serve in a rocks glass over ice. 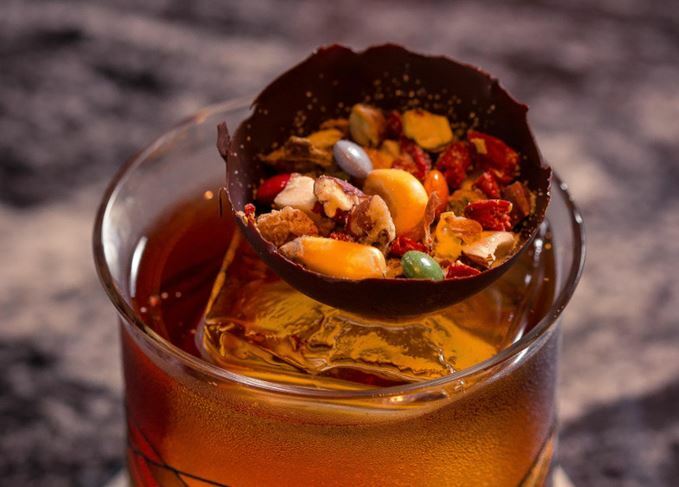 Garnish with a chocolate cup filled with mixed nuts and berries. Build ingredients in a cocktail shaker and whip-shake. Pour into a snifter glass with pebble ice. Rub the rim with a fresh kaffir leaf and a sprinkle of ground mace. Stir all ingredients with ice then strain into a chilled glass. Dave Broom is impartial to chocolate eggs, but there are other ways to enjoy Easter.